A major exhibition opened this week at the Royal Botanic Garden Edinburgh focusing on the Flow Country, one of Europe's last wild places. The Flow Country is a vast open landscape in the far north of Scotland, dominated by blanket bog, a rare type of peatland. It is the biggest blanket bog in Europe. 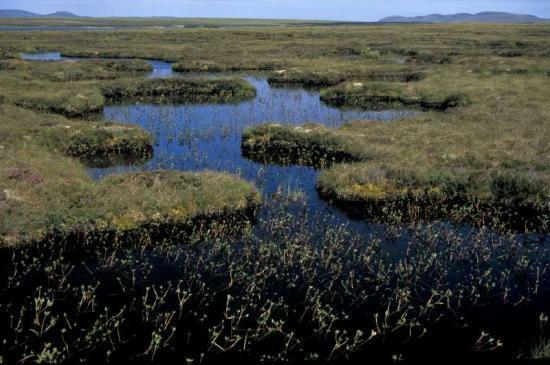 Not only is the area important for all sorts of specialist wildlife, but the bog also acts as a massive carbon store, trapping carbon that would otherwise be released into the atmosphere and contribute to climate change. As well as stunning imagery, the exhibition includes a film, artefacts and hands-on children's activities. There is also a virtual reality landscape model that allows you to fly over the bog as well as taking a virtual walk through the pools and unusual plants. The exhibition will be on display daily from 10am until 6pm from 15 June until 25 September 2017 when it will move to the Glasgow Science Centre. You can find out more at www.theflowcountry.org.uk. The exhibition is part of the Heritage Lottery Fund supported Flows to the Future project, which is restoring seven square miles of blanket bog habitat by removing forestry and blocking drains on RSPB Scotland's Forsinard Flows National Nature Reserve. The project is also connecting people with this precious and important habitat. The Flows Lookout, an award winning viewing tower, has been constructed to allow visitors to view the characteristic landscape from above, and new exhibitions are now in place in Forsinard, Thurso and Strathnaver.